View the Melbourne Campus Master Plan flyover in high-definition. 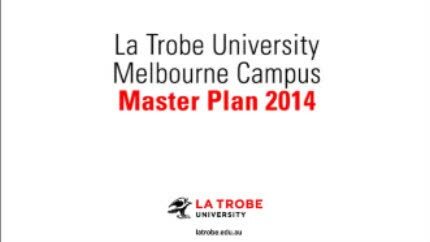 The Melbourne Campus Master Plan 2014 is a comprehensive guide to future development at the La Trobe University's Melbourne campus. The purpose of the Master Plan is to ensure cohesive campus development over time, which balances the varying needs of the University community and maximises the ability of the built environment to embody the values and aspirations of the institution. The Master Plan will serve as a blueprint for growth for all University departments going forward and it will also be used as a tool for review and assessment: a standard that the University can use to review the success and progress of each phase of capital development and growth. The Master Plan has been developed through the lens of the Melbourne Campus Vision, launched in 2012. This vision commits us to being bold and dynamic, cementing our leadership, influence and presence in Melbourne's North and beyond. The Master Plan also respects and acknowledges our unique bushland setting and unique Eco-corridor that traverses the campus. This Master Plan sees our Melbourne campus evolving into a 'University Town'. We are taking an 'outside in' approach, bringing the community into the campus and blurring the lines between the University and our surrounding neighbourhoods. The development of this Master Plan has involved extensive consultation with staff, students, community and business groups, local industry, state and local governments. We have listened to individual and organisations' needs, desires and dreams. Importantly, we have included infrastructure and development ideas, which will benefit both the University and our communities. 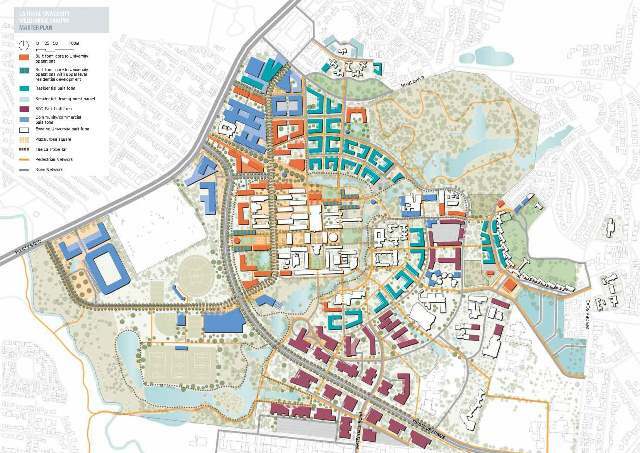 The Master Plan divides the campus into seven neighbourhoods – each of which is uniquely designed to complement the overall vision of the campus growing to become a University Town. The Melbourne Campus will be a place where students, staff and other community members will be able, and want, to study, work, research, live and socialise in a vibrant cultural, sporting and entertainment precinct, open and active during the day and evening, seven days a week.